The Garou cannot recover every cub. Those that suffer the First Change without the support of their tribe are lost. 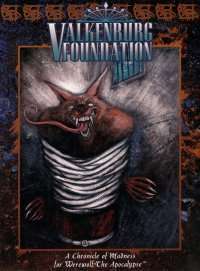 These lunatics run alone in a cruel world of madness - until the Valkenburg Foundation steps in. The characters are recruited to become the Questing Pack and hunt down the lost cubs, those who endanger themselves and the Veil with their madness. From the grimy streets of New-York City to a bizarre government laboratory, the Questing Pack must journey to rescue lost cubs from their dark fates. But something casts a shadow on the Foundation. Can the Pack recognize the danger within and avert in time? Five stories, designed to be run in chronological order, relating the tale of the Questing Pack. Details on the Lunatic Garou, those who cracked under the strain of their Change, and how the Valkenburg Foundation works to cure them. New nemeses for the Garou, from the mysterious Puppeteers to the wrathful Samuel Haight.